21" x 22" x 15"
The art I create is based on my awareness of how the human race is destroying the Earth. I am creating ceramic sculptures that are based on adaptations of life forms that most humans never see, as they are hidden to human eyes under huge bodies of water. Humans have still not figured out the underwater world on this planet; they are too focused on what is visible and unaware of the damage that is committed to the invisible. The underwater world of today is a marriage of natural life forms and decaying remnants of metal objects (ships, boats, planes, cars, etc.). The addition of these man-made objects displays human pollution to underwater life. These metal objects are now becoming apart of aquatic life. These show how quickly the Earth is adapting to an environmental obstacle. This body of work interprets a vast variety of underwater creatures and the way they accommodate the foreign objects. 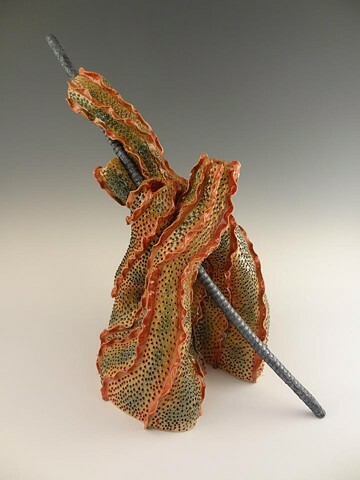 My organic ceramic pieces composed of clay and metal rods reflect this actual underwater connection of the natural and the man-made. I use a hand building method and wheel thrown forms, to construct these pieces. I begin with a clay form and start to give it life, then entering the metal rod as an intrusion the natural evolution to the underwater form. These rods are but through both the bisque and the high glaze fire in the ceramic kiln. This leaves the metal with a corrosion to emulate the process of metals decomposing underwater. I want the viewer to realize that the Earth is trying to take back what is hers, and that she is taking it back everywhere. I want the viewer to leave and be more observant of the world around them and to spend time looking at how the Earth is showing signs of healing. To realize that no matter how much we try to adapt to the Earth, that nothing is faster then Earth herself.